Every spring we expect the renewal of life; it's just that the delivery often comes with surprises. The gentle rain, the warming of the sun, and the breezes that softly caress us are welcome enough. Everything of the plant variety bursts forth with near violent greening. The birds and the bees have already been busy for weeks in their twitterpation. So, too, have our animal life. I found out—again—this afternoon. Saturdays usually find me in the normal mode of weekly cleaning and dealing with the extra loads of linens for the laundry. But now that warmer weather has arrived yard care is also a priority. I had finished up the house in record time and paused over just what to do next. When summer actually arrives I certainly won't be mowing the grass, or crabgrass in our case, at high noon or shortly afterward. You just can't because it's too hot. But those steamy days haven't arrived yet so I filled up the tank and turned the key. This year the battery and the tires are all in working order so all I had to do was ride. Lucky for me, most all the grass can be cut on that aging, coughing, grumbling lawn tractor—because I put in that extra effort to trim as I go. What doesn't get cut is left to the man of the house with his—aging, coughing, and grumbling gas-powered trimmer. I had nearly finished weaving in and out of that line of cedar trees that dot our property line between my neighbor's yard and mine out front—right up to the mailbox. I had made two passes and was coming back when something moved. It was something very small. 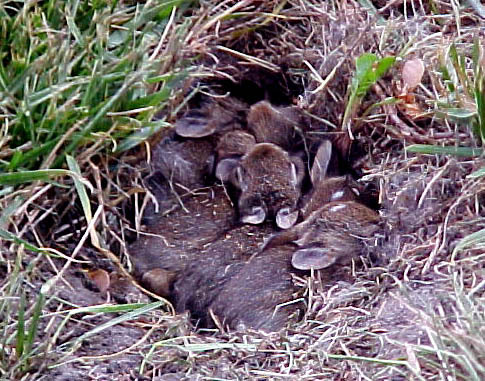 I had uncovered a baby bunny burrow. I diverted the mower and hie-tailed it into the back yard. I was so afraid that I'd hurt them but I didn't dare look. I had to allow time for the commotion to die down. I finished up the back yard with my mind full of the babies. I rushed. I hurried. Most of all I worried. As I drove the old mower back into the garage and shut it off, I found myself scared to go back. I wondered what carnage I'd wrought. Would I see a massacre in the aftermath of those roaring, rumbling blades? Had they limped out into the road where the traffic would surely smash them? A hundred more thoughts, none good, flickered through my mind as I went back to face what I feared was a slaughter of innocents. My pace slowed to a crawl and I held my breath as I approached that shallow depression. They were all there—all eight of them. Apparently the baby that had struggled out had made its way back. There they lay all snug and warm—but exposed. I was stunned. So grateful was I to find them safe I froze. I knew what I had to do but I couldn't move yet—something else was niggling in the back of my conscious. My most urgent thought was to recover them as gently as possible with as much dried grass as I could gather without touching most of it. I didn't want to leave my scent on the grass and make Momma bunny abandon them. CAMERA!!! The word screamed through my mind. I had to get a picture of this before I recovered them and allowed them back into hiding, back into their natural state. I ran back into the house and fumbled with full disks until I found one with 3 shots left. Erin came running to see. Her first instinct was to touch, nuzzle, and cuddle these delicately beautiful babies. I couldn't allow it. She could "see" but not touch and "we" couldn't remain. So I snapped my pix and then gently covered the dozing babes with as much dried grass as was there previously being careful not to put my "human" scent of much of it. We retreated back into the house and kept well away from them. The borning of new life in any of its varieties is always a miracle. Whether it's baby bunnies, kittens, puppies, or even—God forbid—snakes, it is still a wonder. Today was a further miracle of salvation. I surely didn't provide it, but I'm awfully grateful that it happened. So the next time you feel jaded or bored, don't be surprised when nature pulls you up short. Miracles happen every day. We just have to learn to be open to them.